Enhance Your Body Strength Training -This push up stands is a great way to enhance the overall development of the upper body,including the chest,triceps,arms and more effectively with triangle design durable construction push up bars.They enhance push ups by preventing strain on the wrist so you can support your weight on the floor without pain. 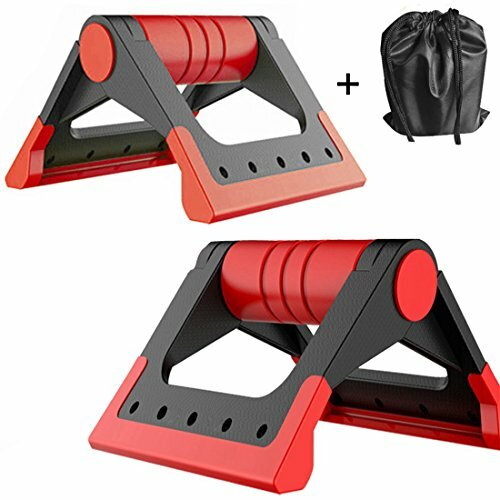 Unique Foldable Triangle Design With a Lightweight Carry Bag - It's portable and easy to fold for storage.Perfect crossfit equipment for traveling or for gym push up bars exercises equipment. Ergonomic Handle Grips and Comfortable Rubber - Protects your wrists.By gripping the handles of the stands,you'll enjoy a greater range of motion during push-ups,helping your muscles develop even more efficiently. No Scratch Floor and TPR Non-Slip Chassis Matches Any Surface - Four nonskid pads on the bottom of each bar provide secure rubber traction on various surfaces such as granite, marble,mat and hardwood floors to protect you from slipping during exercise. We Value Your Safety - Each of our push-up stand is made of non-toxic materials that are free of PVC,latex,glues,and phthalates. Its sturdy construction is designed to bear up to 660 lbs of body weight with any exercise. If you have any questions about this product by HITUN, contact us by completing and submitting the form below. If you are looking for a specif part number, please include it with your message.